If you missed it, I’ve been working on a multi-part series showing how we go about creating a cartoon. If you want to get caught up, you can check out part 1 and part 2 first. Welcome to Part Three of Creating a Cartoon: Rigging and Skinning. Don’t worry, it’s not as creepy as it sounds. Basically, this is the part where we turn our model into a living, breathing, walking and talking character. 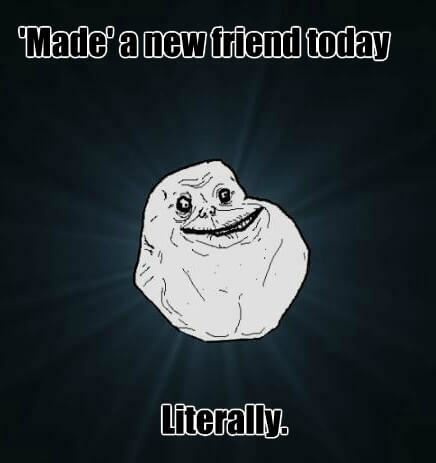 It’s how I turned my imaginary best friend into my real best friend! 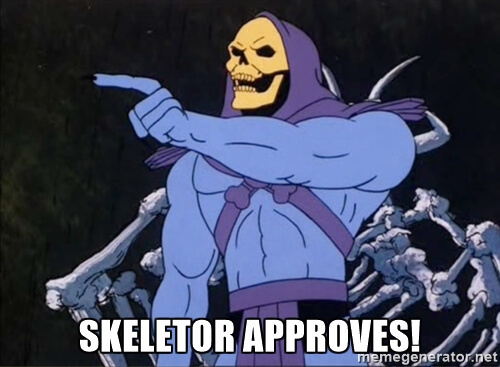 In order to animate a 3D character, you have to create a skeleton for it. Much like real life, the skin can’t move without some sort of scaffolding to hold it up. In the 3D world, we approximate a very simplified anatomy for the character. These anatomies can vary drastically. In the most basic cases, it’s just skin and a skeleton. In more advanced cases, muscles, fascia, and fatty tissue are also simulated. Here’s how Weta Digital does it. The closer you can approximate the proper anatomy, the more realistic the skin will deform overtop of it. In our case, because our character is more cartoony, we’ll be keeping it simple and just simulate the skeleton and a few muscles. First thing we’re going to do is fit a skeleton into our model. We’ll make the skin see through so we can see what we’re doing. 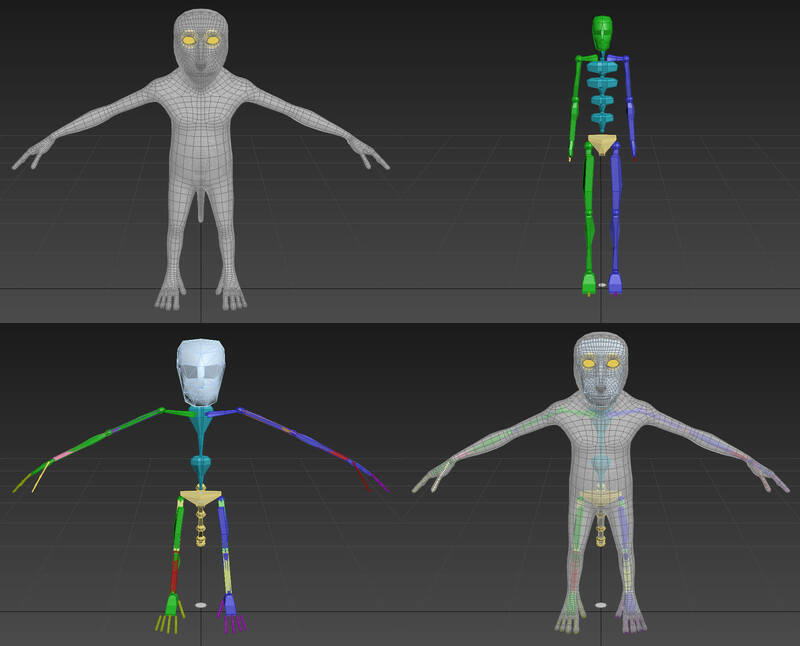 After the skeleton is fitted into the body, we’re going to add a few muscles to get better skin deformations. Here it helps if you have a little knowledge of muscle anatomy to know where the muscles attach to bone. Like in real anatomy, the muscles work by being attached to two bones and stretch and squash between them. Now that we have a skeletal and muscular system, we need to make the skin stick to it. This is called vertex weighting or skin weighting. Vertexes are the corner points for each polygon in the model (we covered polygons in the last episode). Each vertex is given a weight, or percentage, of attachment to the bones or muscles underneath. So a vertex weight might be 10% clavicle and 90% pectoral or 50% bicep and 50% deltoid. Every vertex of the skin model will have weighting that adds up to 100%. This is how you control the way the skin behaves when the skeleton is moved around. Once that’s done, we can attach the clothes directly to the skin instead of the skeleton. Now is a good time to see what it looks like animated. In the next episode, we’ll work on the face to give him the ability to talk and emote. Stay tuned for Part 4: The Face (I’ll think of a fancier name when I get to it)!